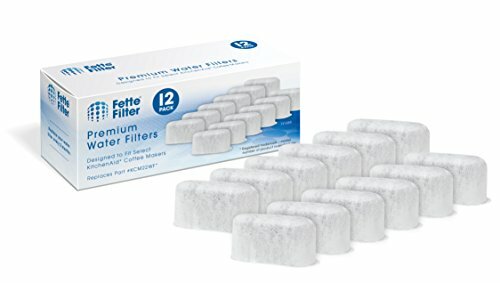 12-Pack - KitchenAid Compatible Coffee Maker KCM22WF Charcoal Water Filter Pods. Contains 12 Activated Charcoal Water Filter Pods. Fits KitchenAid Coffee Machine Models KCM222, KCM223, KCM1402ER 14-cup. This is not a KitchenAid® OEM product. The KitchenAid® brand names and logos are the registered trademarks of their respective owners. Any use of the KitchenAid® brand name or model designations for this product are made solely for purposes of demonstrating compatibility.